Ferdinand Bol (1616–1680), The Fearlessness of Fabricius in the Camp of Pyrrhus (1655-56), oil on panel, 71 x 54.5 cm, Amsterdam Museum, Amsterdam, The Netherlands. Wikimedia Commons. The name of Pyrrhus may ring a bell: it appears in an English phrase, a Pyrrhic victory. He is another of Plutarch’s subjects who has left a lasting impression, although very few of us know quite why. Worse, the name Pyrrhus is a family name, and the Greek general who is the subject of this book in Plutarch’s Lives was a relative of another famous Pyrrhus, who had previously been known as Neoptolemus, the son of Achilles. Pierre-Narcisse Guérin (1774–1833), Andromache and Pyrrhus (1810), oil on canvas, 342 x 457 cm, Musée du Louvre, Paris. Wikimedia Commons. 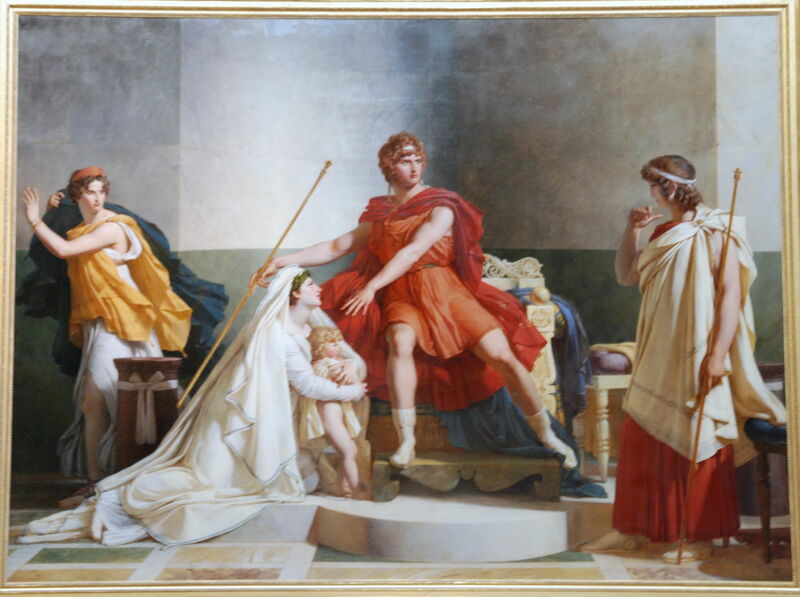 Indeed, my first painting is Pierre-Narcisse Guérin’s Andromache and Pyrrhus from 1810, which shows the Pyrrhus who had been Neoptolemus with Andromache, Hector’s widow, who was given to him as a concubine, and became the subject of two plays by Euripides. Plutarch’s Pyrrhus was the son of Aeacides, who was expelled and replaced in power by the sons of Neoptolemus. During that coup d’état, friends of Aeacides were killed, and the life of the infant Pyrrhus was in danger. He was stolen away for his own protection. During the flight, the party accompanying him had to cross a river in full spate. They did so by sending a message written on bark to locals on the other side, who rigged a temporary bridge from felled trees. Nicolas Poussin (1594–1665), Rescue of Young King Pyrrhus (1634), oil on canvas, 116 x 160 cm, Musée du Louvre, Paris. Wikimedia Commons. 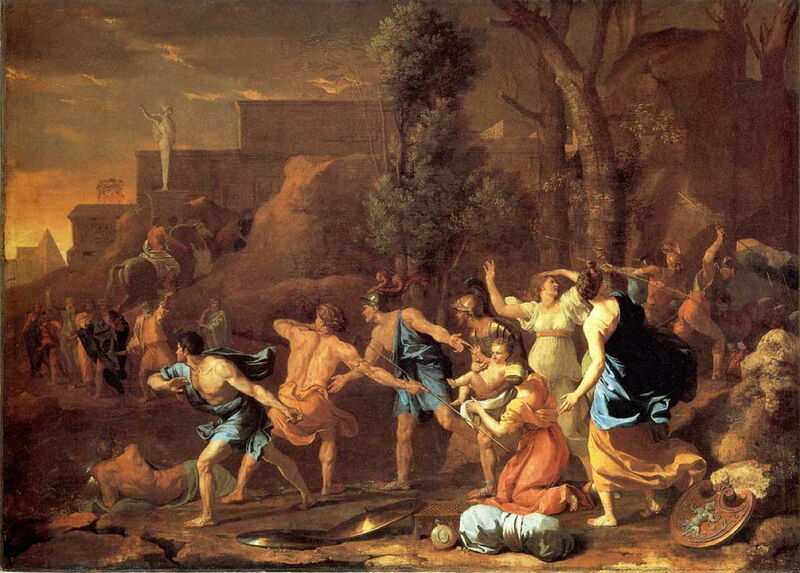 Nicolas Poussin’s Rescue of Young King Pyrrhus from 1634 shows the party trying to rescue Pyrrhus throwing their message across the swollen river, in their bid to cross to safety on the other side. At the right, some are chopping down trees in their effort to build an improvised bridge over the waters. Eventually Pyrrhus and his guardians reached King Glaucias of the Illyrians. The king was reluctant to shelter the young child, as he feared those who had seized power from Pyrrhus’ father. While the king was trying to make his decision, the infant Pyrrhus pulled himself up on the man’s robe, clung to his knees, and wept like someone pleading with a ruler. Glaucias was first moved to laughter, then to pity, and decided to raise the child as one of his own. François Boucher (1703–1770), The Young Pyrrhus Saved (date not known), media and dimensions not known, Musée des Beaux-Arts, Rennes, France. Wikimedia Commons. 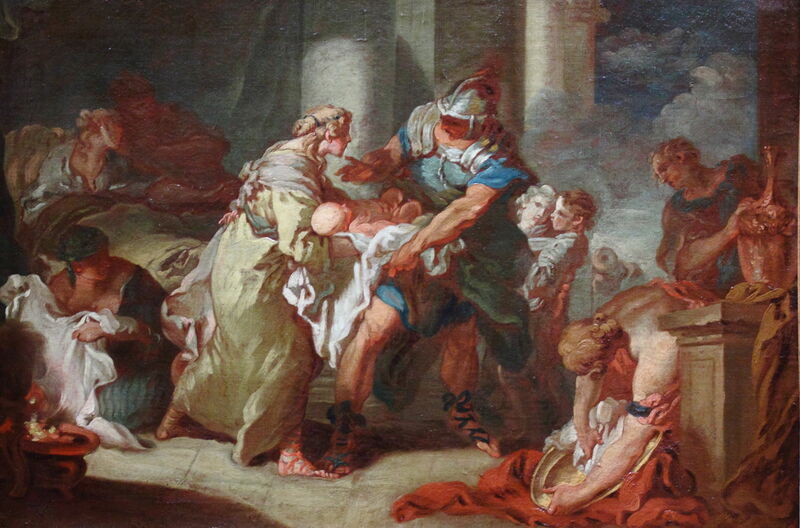 In a very painterly depiction which appears to have been a preparatory sketch, François Boucher’s undated The Young Pyrrhus Saved shows King Glaucias handing the infant to his wife, for her to bring up with the rest of their family. In the right foreground, one of the party who brought the child there is unwrapping a large gold plate which was intended as compensation for the king for taking the trouble. When Pyrrus reached the age of twelve, King Glaucias took him back home with a military force, and restored him to the throne. Five years later, though, when he went to attend a wedding, he was stripped of his kingdom, so allied himself with Demetrius. They remained friends in the battle at Ipsus, where Pyrrhus fought bravely, and later served as hostage during peace negotiations with Ptolemy. In time, Pyrrhus returned to share the throne of his birth with Neoptolemus, until he found the opportunity to invite Neoptolemus to supper and there kill him. Demetrius came to power in Macedonia, and his army challenged that of Pyrrhus, who with his Molossians overwhelmed the invaders. He pressed on into Macedonia, where the opposing army changed allegiance, allowing him to complete his invasion and to become king of Macedonia too, without a blow being struck. He was forced to divide his newly-won kingdom with Lysimachus, though, and as the two could not get on together, they seemed perpetually to be at war with one another. Lysimachus attacked the logistic support for Pyrrhus’ army at Edessa, so Pyrrhus withdrew completely from Macedonia, leaving its rule to Lysimachus. At that time, Rome was at war with Tarentum, whose people appealed to Pyrrhus to defend them, so that he could rule them too. Pyrrhus was persuaded to give them support, and sent forces in advance. When the king tried to cross the sea, though, their ships were scattered by a storm from the north. Eventually the whole of his army reached Tarentum, only to discover that its citizens would do nothing in their own defence, and Laevinus the Roman consul was on his way with his army. In the protracted battle that ensued between Pyrrhus and the Romans, Pyrrhus himself was wounded, but the Romans were eventually defeated, with the loss of as many as 15,000 of their men. The Romans did not accept this as a defeat of their army, but blamed its leader, Laevinus. Pyrrhus sent Cineas as his representative to Rome, but he was unable to persuade its senate to accept any proposals for peace. Instead, the Romans demanded that Pyrrhus and his troops leave Italy, or they would continue to fight him so long as he remained. Rome then sent Pyrrhus an embassy led by Caius Fabricius, who was held in high esteem in Rome but exceedingly poor. Pyrrhus showed the Roman great hospitality, and offered him gifts of gold as a mark of friendship and respect. Caius Fabricius declined them. Ferdinand Bol (1616–1680), Scene from Ancient History: The Incorruptibility of Gaius Fabricius (c 1650), oil on canvas, 89.5 × 83.8 cm, Worcester Art Museum, Worcester, MA. Wikimedia Commons. 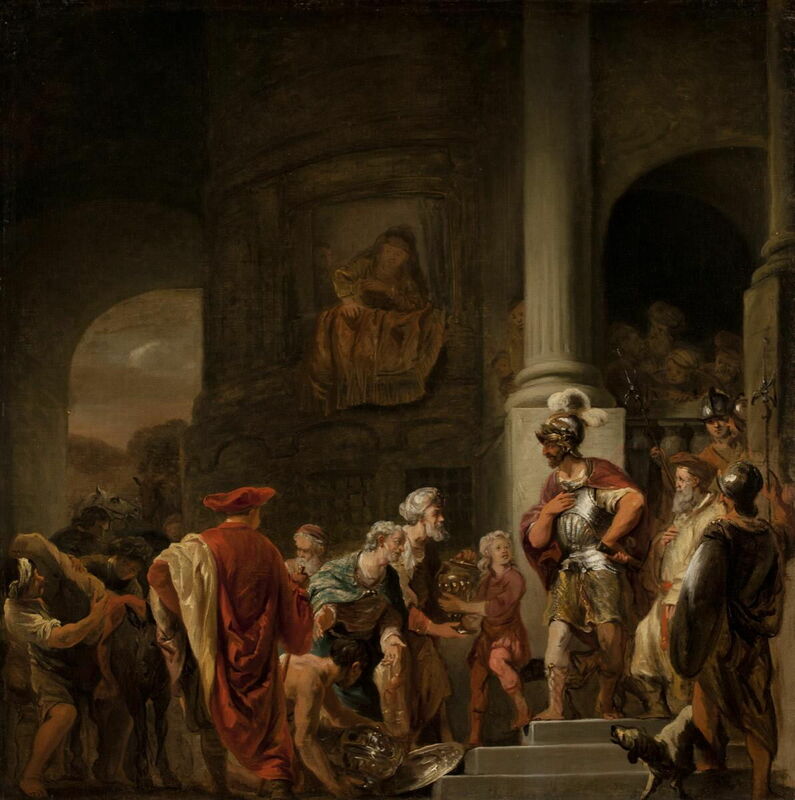 This is shown in Ferdinand Bol’s Scene from Ancient History: The Incorruptibility of Gaius Fabricius from about 1650. Pyrrhus is the old, bearded man sat on the throne at the right, as Caius Fabricius (standing, in helmet and armour) declines the large gold plates and vases being offered to him. Next, Pyrrhus tried a different tactic. Like Hannibal, he used elephants in battle, so the following day, he had one of his war-elephants concealed behind a large drape near where he met to speak with the Roman. When Pyrrhus gave the signal, the drape was removed, unveiling the huge elephant, which raised its trunk and emitted a fearful cry. 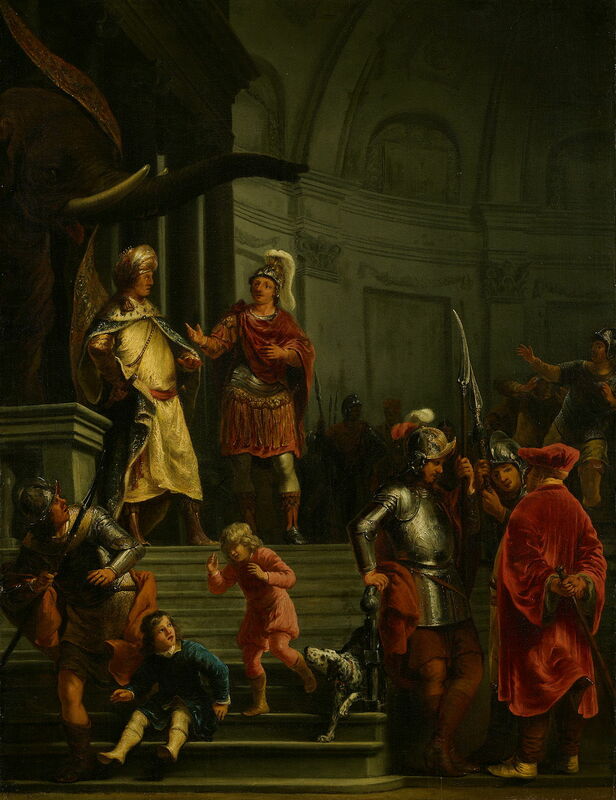 As Bol shows in his second painting, of The Fearlessness of Fabricius in the Camp of Pyrrhus (1655-56), the Roman turned calmly to Pyrrhus and told him that neither the gold nor the elephant made any impression on him. Pyrrhus and Caius Fabricius (who later became consul) developed great mutual respect, but found no acceptable solution. After Pyrrhus dealt with a threat to his life, he engaged the Roman army again at Asculum, where he was eventually able to deploy his elephants with effect. However, casualties were heavy on both sides, and when Pyrrhus was congratulated on his narrow victory, he said: “If we are victorious in one more battle with the Romans, we shall be utterly ruined” – the origin of the phrase Pyrrhic victory. Pyrrhus then sailed to Sicily, where he hoped for and got easier pickings. From success there, he turned his attentions to Libya. To obtain sufficient men for that campaign, he started to behave as a tyrant, which lost him support, driving him to return to Italy instead. When trying to set out with his returning army, the Carthaginians combined forces with Sicilian ships and he lost many of the vessels in his navy. He ended up in a land battle, where only his personal leadership and valour won the day. His next battle was against Roman forces once more, under Manius Curius at Beneventum, where Pyrrhus’ army was finally routed, and forced to return to Greece after six years of victorious but ultimately unsuccessful campaigning. Once back in Greece, he was invited by Cleonymus the Spartan to help him supplant Areus, King of Sparta. This Pyrrhus was willing to do, as he thought it would bring him the whole Peloponnesus. François Topino-Lebrun (1764–1801), The Siege of Sparta by Pyrrhus (1799-1800), further details not known. Wikimedia Commons. 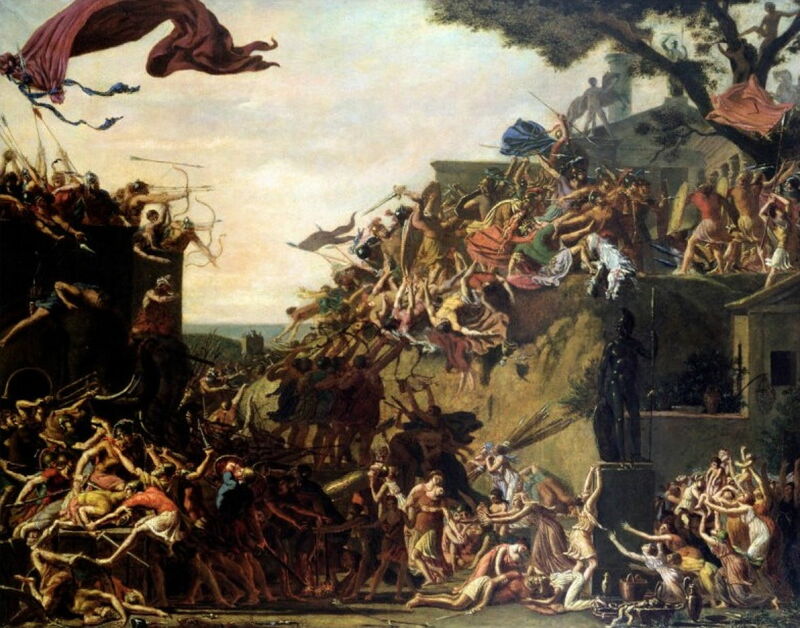 François Topino-Lebrun depicted this in The Siege of Sparta by Pyrrhus from 1799-1800. The Spartans had dug a huge trench to protect their city from the elephants, whose defence the women of Sparta handed over to the young men, and at each end they sank all their waggons up to their axles in soft ground as further obstruction. After a day of pitched battle trying to negotiate these obstacles, Pyrrhus withdrew to rest for the night. The following day, reinforcements arrived for the Spartans, and he made no progress. He therefore decided to break camp and head to Argos. On their way, as they were being harried by Spartans, his son Ptolemy was killed in action. Pyrrhus led a cavalry charge against those Spartans, and killed its commander. Pyrrhus entered Argos in the dead of night, but was delayed because he couldn’t get his elephants through the city gate without removing their fighting towers. This allowed the defenders to fight back, and when Pyrrhus saw the resulting carnage at first light, he decided to withdraw. He was forced to turn and fight the enemy as they pursued him in retreat: the mother of one of the enemy threw a roof tile at Pyrrhus, which struck him below his helmet and crushed his lower neck. He fell from his horse, and an enemy soldier beheaded him with his sword. Posted in General, Life, Painting and tagged biography, Bol, Boucher, Guérin, history, morality, painting, Plutarch, Poussin, Topino-Lebrun. Bookmark the permalink.